I used to go to Slovenia, my home country, 2-3 times a year but in the last year or so I’ve been visiting Slovenia more often and that’s because I am learning to drive there. Yes, I am going to pass my driving test in Slovenia, not the UK! A little bit crazy, you may think, but it makes sense as once we have a house there (with my fiance) we will need a car and I need to be able to drive! So… my last visit in Slovenia consisted of lots of driving lessons but I also tried to make my break a little bit more exciting so I planned some activities for me and my fiance. At the end, we managed to do quite a bit of cycling and some hiking. We could have done more but it was difficult to fit everything in when the driving lessons were a priority. 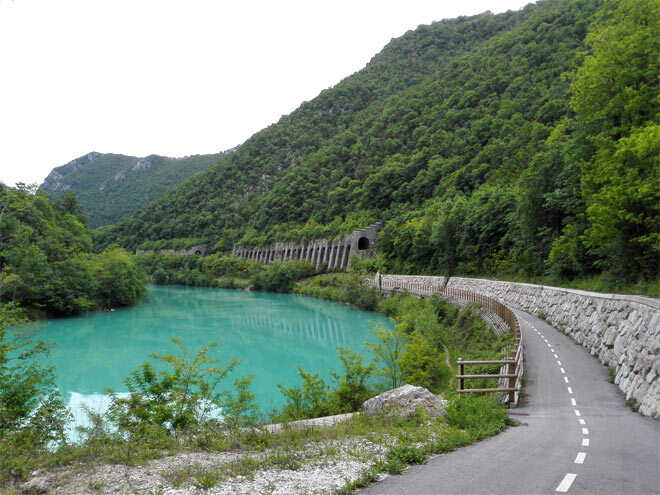 Cycling by the river Soca is one my favourite things to do when I am in Slovenia. You start in Solkan on a traffic-free cycling trail which will take you to Plave where you continue on a quiet road all the way to Kanal. The scenery is beautiful – lush greenery coupled with the emerald river on your right will make you forget a few small hills on the way. I actually wrote about this route on my blog last year, just check out this post. 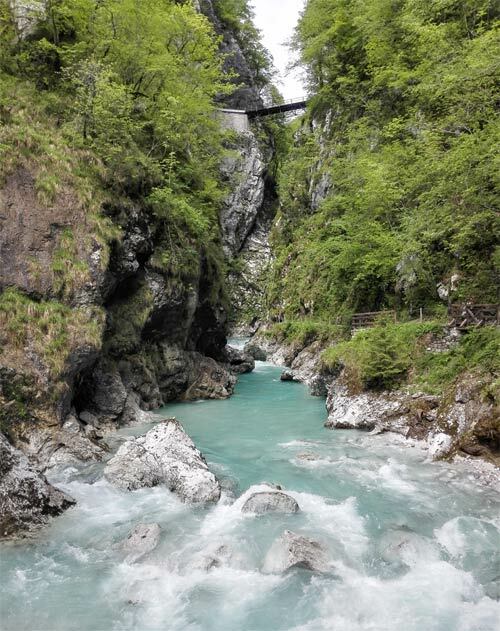 You will find Tolmin Gorge at the entry point into the Triglav National Park, not far from the town called Tolmin. To get to Tolmin Gorge, we took a train from Solkan to Most na Soci first and this took only about 45 minutes or so. From Most na Soci we cycled to Tolmin (I think about 6km) and once we arrived there we easily found our way to Tolmin Gorge which was very well sign-posted from the Tolmin centre. On the way to Tolmin Gorge there was some climbing involved, just a warning! We left our bikes by the entrance where we started our walk. Tolmin Gorge is a beautiful place to visit – this is where Tolminka river and Zadlaščica river meet and the scenery is just breath-taking. Both streams have carved deep gorges into the rocks creating an interesting landscape which includes some caves as well. The gorge offers spectacular views of the crystal clear turquoise water and the circular walk through it takes about an hour, an hour and a half. We extended it by following a path up, to this food place that I forgot the name of! But it is sign-posted from Dante’s cave so you won’t miss it. The path up was a bit strenuous but not too long and we finally got on top where we had a deserved rest and some local delicacies. This made our walk a proper hike and maybe a few hours long altogether. After our rest, we made our way back to where our bikes were and cycled back to the train station. Kras Plateau is a popular place for cyclists and I’ve cycled there several times before. It’s great because there is not much traffic and hills make it great for those who like a bit of a challenge. We started our ascend from Miren and just to mention, it’s not an easy ascend, you do need a bit of a stamina to get on top as the hill drags on for quite a few kilometres. But this is what I like. A challenge. That’s why I always get excited about long rides and steep hills, also if they make me really tired and test my fitness levels greatly. Anyway, once you get on top it’s not that difficult. Yes, it’s still hilly but manageable. 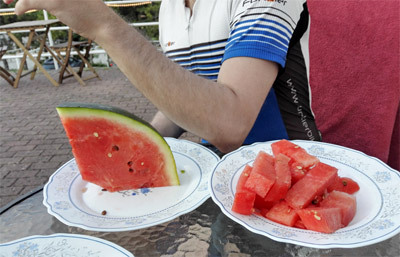 We cycled through different Karst villages and stopped for some local food in one of them before we descended through Sela na Krasu. We then reached an Italian border and entered Italy where we cycled for a while before entering Slovenia again. It was a good ride. I was surprised to learn that we did 55km in total after plotting the route on the map. It was a good workout, just a shame I didn’t take any pictures! At the end of our break in Slovenia, we decided to spend a few days on Slovenian coast and take our bikes with us. To get to the coast with our luggage and bikes (no car! ), we took a train journey from Sempeter to Koper (3 trains in total). Once we reached Koper we cycled on almost traffic-free cycling trail for about 18km. We were a little bit slow with all the luggage but we didn’t cover that much distance on the first day so it wasn’t too bad. There were quite a few hills on the way so we still got some good exercise. Our cycling route started in Portoroz and it all started very easy, on a flat easy-to-follow Parenzana cycling route. We continued to follow this cycling route until just before the border with Croatia and here is where we turned left, towards a village of Dragonja. We then continued cycling in Dragonja valley, on a gravel road where cycling was easy, on a mostly flat surface. The Dragonja valley is surrounded by an unspoilt nature so it was really lovely to cycle there. The easy cycling came to an end when we decided it was time to go inland, back towards the coast. It was actually my idea. I like circular routes, I never like to go back the same way as it’s boring. I’ve already seen it so why see it again?? Little did I know… the route which I chose for us to go back on was extremely demanding. When we started climbing we had no idea what we were getting ourselves into. I thought, ok this uphill road is just taking us to the little village just in front of me. But no, we got to the first village and the hill continued on and on. It was a bloody never-ending hill. We were puffing and sweating and my fiance swore that he would never let me take a lead again. He complained. A lot. It was hot as well so I don’t blame him. At some sections we walked. I was getting tired but I didn’t complain. I never complain, I just silently accept the struggle and fight through it. I have a very strong mind and I am not defeated until I get a muscle fatigue. After this view, we started the descend (or was the view during the ascend? I forgot!). What a relief and no muscle fatigue! Going downhill is the best thing ever. Your muscles relax and you get a well-deserved rest. The downhill was quite long and we were enjoying it. A lot. No traffic. And then we got to the main road and had to figure out the best way to Izola where the traffic-free cycling route began. 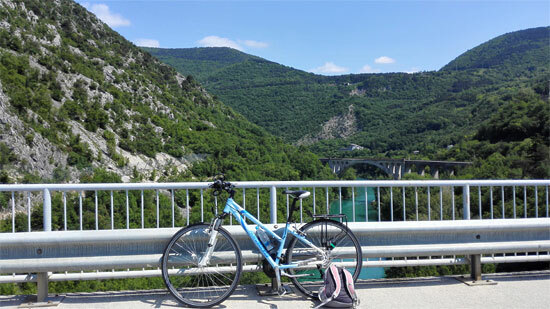 My fiance reluctantly agreed to go via Gazon – it just meant a little bit more climbing for us but we did it. And we got to Izola and felt much happier then after all the climbing. 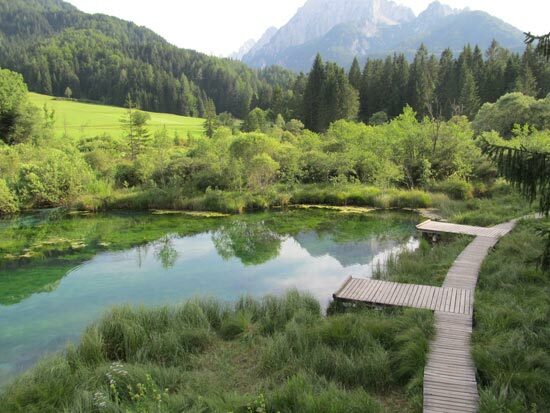 What do you think of Slovenia, isn’t it a great place for active holidays? Slovenia is one of my favourite countries to visit! 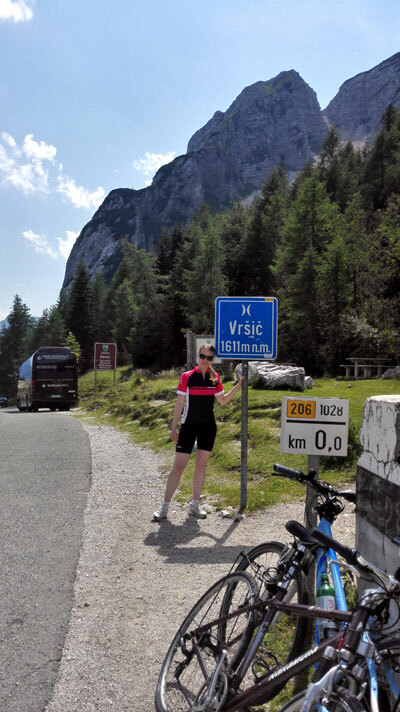 We had a wonderful active holiday there.. travelling from Ljubljana, to the caves at Postojna then to the Portoroz and Piran coast, back up to Bovec, Boca River, the Vršič Pass and Triglav peak…. ending in Lake Bled. It was all beautiful. We went to Croatia the following year and ended up crossing the border back to Slovenia to re-live some of our best memories. I’m so glad I’ve come across your blog, Petra! Please keep up the great work. So good to hear you love Slovenia (who doesn’t??) and all the places you visited are actually the best attractions and I would definitely recommend them. Really good trip you had and so good you didn’t miss Soca river and Lake Bled. I love going back to these places whenever I can. I am really happy to hear that you are enjoying my blog Claudia. Slovenia seems to be a great place to visit. I just put into my next trips list. Yes, it’s lovely, definitely one for your list!